Heat recovery air handling units in sound- and heat-insulated casings. Air flow up to 830 m³/h. Heat recovery efficiency up to 98 %. The VUT/VUE HB EC and VUT/VUE HBE EC air handling units are the fully-featured ventilation units that ensure air filtration, fresh air supply and stale air extract. At the same time, the heat of the extract air is transferred to the supply air due to the high-efficiency counter-flow plate heat exchanger. 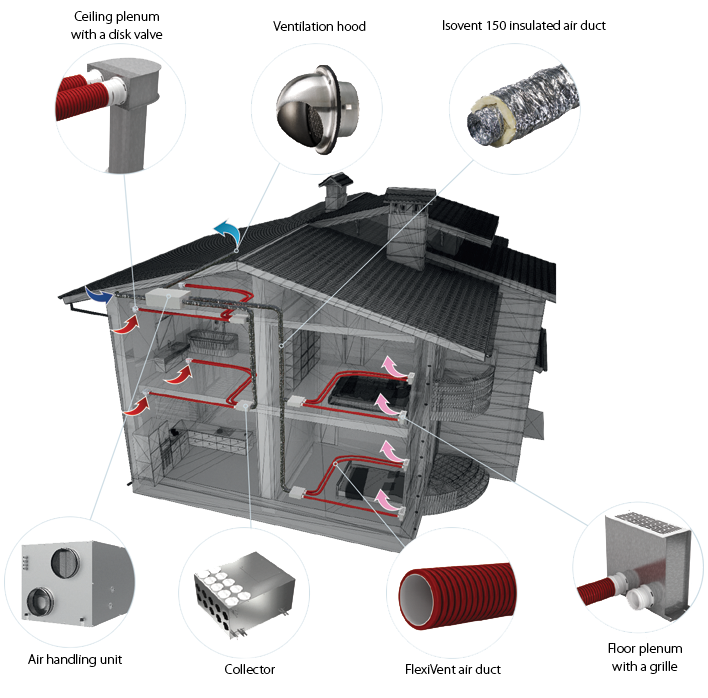 The units are applied as components of ventilation and air conditioning networks for various premises. Due to high-efficient EC motors and expanded counter-flow heat exchanger surface the energy saving parameters of the units are the best at the market. Designed for connection to ø160, 200 and 250 mm round air ducts. The VUT HB EC model is equipped with a counter-flow heat exchanger made of polystyrene, a bypass and EC motors. The VUT HBE EC model is equipped with a counter-flow heat exchanger made of polystyrene, a bypass, EC motors and an electric heater. The VUE HB EC model is equipped with a counter-flow heat exchanger made of enthalpy membrane, a bypass and EC motors. 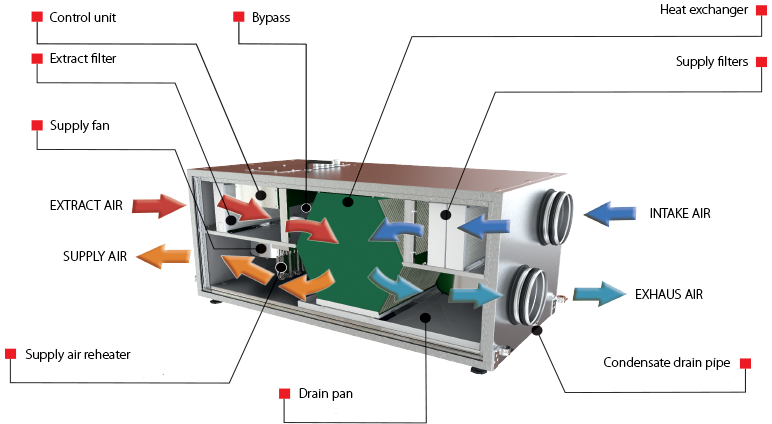 The VUE HBE EC model is equipped with a counter-flow heat exchanger made of enthalpy membrane, a bypass, EC motors and an electric heater. Made of aluzinc steel, internally filled with a 40 mm mineral wool heat- and sound-insulating layer. High-efficient electronically-commutated motors with external rotor. These state-of-the-art motors are the most advanced solution in energy efficiency today. EC motors are characterised with high performance and optimum control across the entire speed range. In addition to that, the efficiency of the electronically commutated motor reaches very impressive levels of up to 90 %. The unit sizes 300 and 400 are equipped with constant flow fans with forward curved blades. These fans provide constant set air flow even in case of variable air resistance in the ventilation system, i.e. in case of clogged filters. The 700 size units are equipped with fans with backward curved blades. Two built-in panel filters with filtration class G4 and F7 provide efficient supply air filtration. The G4 panel filter is used for extract air cleaning. The VUT units are equipped with a counter-flow polystyrene heat exchanger. In the cold season the extract air heat is captured and transferred to the supply air stream which reduces the ventilation-generated heat losses. This can lead to formation of condensate that is collected in a special drain pan and discharged into the sewage system. In the warm season the ambient air heat is transferred to the exhaust air stream. This allows for a considerable reduction of the supply air temperature which, in turn, reduces the air conditioning load. The VUE units are equipped with a counter-flow heat exchanger with an enthalpy membrane at the core. In the cold season the extract air heat and moisture are transferred to the supply air stream through the enthalpy membrane reducing the heat losses from ventilation. The ambient air heat and moisture are transferred to the exhaust air stream through the enthalpy membrane in the warm season. This allows for a considerable reduction of the supply air temperature and humidity which, in turn, reduces the air conditioning load. The VUT/VUE HBE EC units are equipped with an electric heater for additional heating of supply air downstream of the heat exchanger. The VUT/VUE HB EC A21 units are not equipped with a built-in electric heater. It is available upon separate order and may be integrated into the unit. The unit is equipped with a bypass which is automatically opened in summer if there is a need to cool down the ventilated area with cool intake air. If the unit is equipped with an electric heater, the bypass is used for freeze protection of the heat exchanger. If the unit is not equipped with an electric heater, in case of freezing danger according to the temperature sensor readings the supply fan is stopped and warm extract air warms up the heat exchanger. After the heat exchanger defrosting and when the freezing danger is no longer imminent, the supply fan is restarted and the unit reverts to the standard operation mode. The VUT/VUE HB(E) EC A21 units are equipped with an integrated control system. The remote control panel is not included in the delivery set (purchased separately). 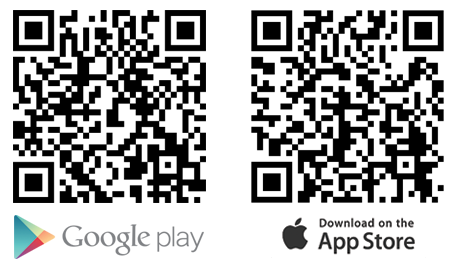 To control the unit using a mobile application via Wi-Fi, you need to download the VENTS AHU mobile application. In the VUT/VUE HB EC A14 units, freeze protection is based on cyclic stops of the supply fan, while the warm extract air warms the heat exchanger. Then the supply fan is turned on and the unit reverts to normal operation. Freeze protection in the VUT/VUE HBE EC A21 units is achieved by a bypass. A preheater can be additionally installed in the VUT/VUE HB EC A21 units for freeze protection. The unit is designed for suspended or floor mounting. Access for service and filter cleaning from the front panel. During mounting stage the front and the back panels can be reversed providing either left-handed or right-handed unit mounting.